I have chosen the domain name “Harmonices Mundi” based on the fifth book of world harmonics written by Johannes Kepler (1617). In it Kepler saw “the utmost harmony” in the celetial movement of the known five planets at the time. They were analytically and geometrically defined on fundament of the three Kepler Laws. From today´s perspective the boundaries of the visible world in the macrocosm have extended to the limits of the observable universe. Especially in the physics of elementary particles of the microcosm we now have the ability to measure the reduction of atomic entities and quantum metrics. Kepler deduced the “Harmony of the world” out of the five platonic bodies and the five known planets. At present we are still searching for the harmony between the physics of the universe, the particles physics and the biological physics. Under the consideration of the latest findings of particle physics, statistical physics and applied mathematics (especially in topology, group theory and explorative factor analysis) I have come to the conclusion, that the above cited harmony is a fractal. Meaning that the “large universe” is self-similarly, contained in the “small elementary particles” as well as in the genome of the unicellular organism. In the following I am introducing a new dimensionless“Statistical-Factor-Physics”, based on lectures at the “Deutschen Physikalischen Gesellschaft” (German Physical Society) in 2004-2016. The lectures are documented in the VERHANDLUNGEN of the DPG. Remark: The reader is kindlyrequested to start with chapter 2.1 include 2.1.4 in order to gain complete access to the above “New Physics”. In order to understand and evaluate the universe in its current, complex and collective condition a new fundamental theory is necessary. The currently applied "analogous physics" with their analogous equations and functions of a physical evaluation and understanding of complex systems, such as of the universe, are not suitable anymore. The current physical hypotheses and theories of cosmology and gravitation are based i. a. on the 100 years old postulate of space-time, the speculative multiverses, the string theory, the quantum loop gravity, the omnipotent Higgs field etc. Up to now all these hypotheses and theories could not be proven experimentally nor verified mathematically. There is the risk that physics and cosmology increasingly mutate to "myth physics". Therefore a new type of physics is required which bearing in mind the newest scientific results of cosmology, particle physics, mathematics, here especially the group theory, the topology and the factor analysis illustrates and evaluates complex systems as well as shows their developments. For the first time, for the evaluation and understanding of the observable universe methods of "static physics" are applied to the accessible phase spatial volume. Not only the entropy but also parameters of order of the universe are determined. 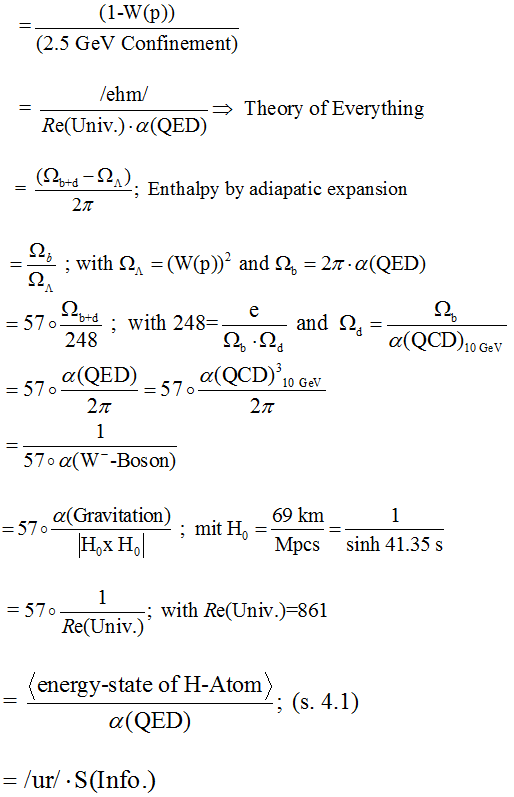 By applying the explorative factor analysis to the gravitational constant -G- one further innovative access to understanding and evaluating the universe is given. From this the basic parameters such as mass, radius, age and Hubble parameter of the universe can be deduced. If the universe is regarded as a closed thermodynamic system, the entropy of the universe at the time of primordinal nucleosynthesis and at the time of the spontaneous refraction of symmetry at the cosmic beta decay can be determined. In order to precisely execute the calculations, the accessible phase spatial volume must be known. The entropy is proportional to the logarithm of the accessible phase spatial volume (W), i.e. the number of the accessible macro systems. The entropy of the universe is a measure for the usage value of the energy contained in the universe, that means their ability to perform work. (W) is a probability density operator, it contains all available physical information about the macro levels of the universe. (1-(W)) is a measure for the information which is missing due to the knowledge of the macro levels in relation to the micro levels, i.e. it does not exhibit an utilisation value. In the primordinal nucleosynthesis the first spontaneous order of the thermodynamic “neutron gas” (0.9395)3 takes place at 3 degrees of freedom. The additional macrostates such as of energy density distribution, gravitation as well as the average linear matter density are determined in the form of factors (smaller than 1) and then the accessible phase spatial volume per 1 meter is determined from them. Following the nucleus-synthesis there was a spontaneous “cosmic beta-decay”, a break of symmetry of the “weak interaction” at constant entropy. 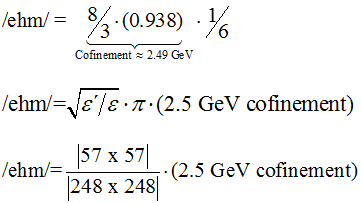 The factor (0.9383) represents the energy of the proton 0.9383 GeV. It follows that 1/6 of phase spatial volume has no usage value, this corresponds to the superposition of energy density of dark matter Ωd with the energy density of dark energy ΩΛ. This also means that dark matter and dark energy may only be measured and understood indirectly. The shadow world! The dark matter and the dark energy results from the non accessible phase space W(n,p) =1/6 at the primordial nucleus-synthesis. The dark matter is thus the part of the proportion of the phase space volume at which no cosmic beta decay took place. The dark matter is thus the entropy of the phase transition of QCD (at about 10 GeV) at the condensation of the bright baryonic matter. The bright world! The “cosmic beta-decay” is a fractal of the “weak interaction” ! The size of the entropy of the universe S(Univ.) 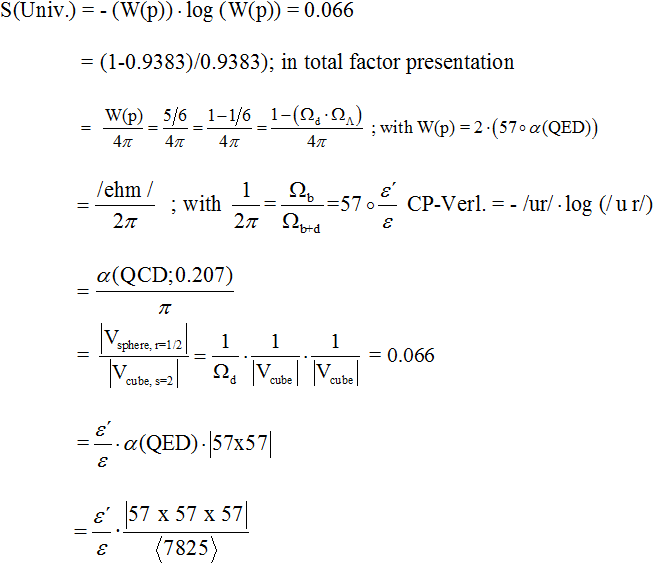 is proportional to the logarithm of the accessible phase volume W(n,p)=0.833. The size of the entropy of (0.0661) is the prime factor of the universe! The prime factor is the transformation key, in terms of information the PIN, for a Theory of Everything. The entropyof the universe S(Univ.) can be also understood as the unification volume of a cube with the enrolled sphere. The entropy of the universe S(Univ.) can also be understood as the sum of the energy density entropy S(b,d,Λ). Under item 2.1.5 the relations, symmetries and parameters I found are listed, explained and exemplified. 2.1.4.1 Average linear matter density of the universe /ur/. The average linear matter density /ur/ is a new natural constant and fundamental in cosmology. The average linear matter density /ur/ is the expectedprobabilityvalue of a proton per 1 meter in the universe. The average linear matter density /ur/ is the relationship of the linear unit density (1kg/1m) of the laboratory system to the maximum possible linear Planck density (m(Pl.)/l(Pl.)) in quantum metrics. The /ur/ superposed, makes average and percolates quantum metrics with the metrics of the universe to the unit-metrics of the laboratory system. The average linear matter density or probability density is thus ca. (4/9) protons per 1m. 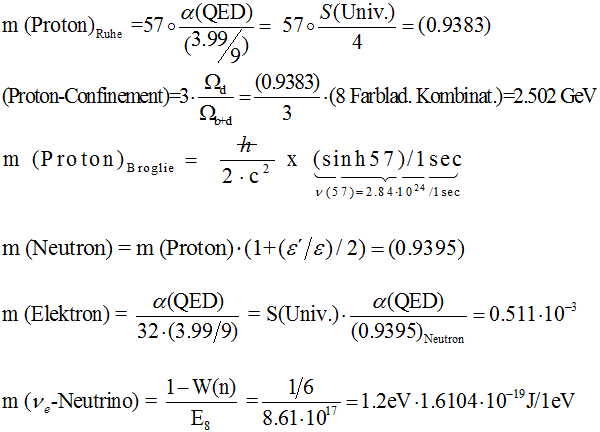 For an oscillation of the density distribution therefore about (1-/ur/) = 5/9 meter are "proton free". 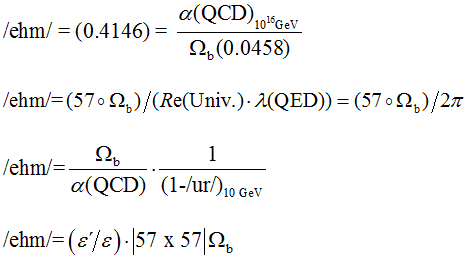 The probability density /ur/² = (0.1945) and corresponds to the value of QCD at about 10 GeV. /ehm/ /1m represents the gravitational field strength of the universe and is the standardized linear “energy mass quantum” (Joule/1m) of the universe. The /ehm/ /1m replaced the 4-dimensional "spacetime"! The entropy of the universe S(Univ.) or the phase spatial volume W(p). The linear matter density /ur/ or the energy mass quantum /ehm/. The energy density distribution of the universe Ωb, Ωd, ΩΛ. 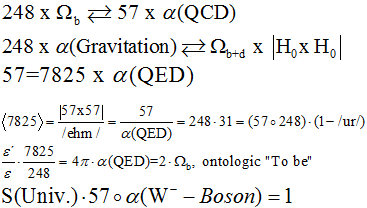 The coupling constants of the 4 forces of nature α(QED, QCD, W-Boson, Gravitation). The Reynolds number of the universe Re(Univ.). The algebra of the E8-group, the 57-dimensional object with 248 degrees of freedom. If it works to show the entropy of the universe S(Univ. ), the “prime factor of the universe”, as functions of the above factors and parameters, through the mutual comparison of the functions each parameter or factor may be understood and determined as the others function. Thus, there is the possibility to create a “Theory of Everything” with regard to cosmology, particle physics and biological physics. The Reynolds number is an order parameter which determines the strength of the interaction of a test object with the ambient medium. The Reynolds number is the relationship of the specific convection impulse vector to the specific diffusion impulse vector. From the above presentation it is evident that the Hubble vortex constitutes the specific diffusion impulse vector and the gravitation and entropy constitutes the specific diffusion impulse vector. The product of the parameters of order S(Univ.) x Re(Univ.) = 57(dimensional object) represents the complex basic form of a “Theory of Everything”, it superposed the entropy of the universe with the flow medium of the universe and the smallest genome of an unicellular organism (473 genes)! The technical fluidic analogous to Re(Univ. )=861 would be a “mosquito” with a relative speed of (1m/1s). Symmetry groups are applied to complex collective systems in order to reduce complexity and to identify the microsystem and factors. Definition: A group is a quantity with a link of two elements taken from among this quantity. The E8-group has 248 degrees of freedom in the rotation of a 57 dimensional object and is 8 dimensional itself. The E8-group is the real dimensionless representation of all possible symmetry operations in the universe. The 57 dimensional object of the exceptional E8-group is the percolator, filter of the universe. Moreover, it makes the transformation of quantum metrics into the three-dimensional laboratory system possible. From the unification volume of a 57 dimensional unit- cube with the enrolled 57 dimensional unit- spehre the smallest possible quantum theoretical linear percolation space (filter factor) in the amount of 4/3 Planck lenghts can be determined. The percolation operator initiates the first algebraic access for the quantum space/metric! This means that the percolator is limited on maximal 57 dimensios. At 58 dimensions the Planck length would be fall! A geometrical analogon to the 57 dimensional object would be a dual object consisting of an icosahedron (20 equilateral triangles and 30 edges) and a dodecahedron (12 pentagons and 30 edges) which percolates, filters with its (2x30) edges it has in common minus 3 laboratory systems = 57 edges. The information content of the universe is determined from the superposed macro-states of the linear matter density /ur/ per 1 meter. In order to correctly carry out the calculation the accessible phase spatial volume has to be determined. The entropy of this phase spatial volume corresponds to the information content of the linear matter density of the universe. The linear matter density /ur/ exist in two pure conditions. From the superposed phase space it is apparent that the gravitation and dark energy density distribution, on a location domain of one meter, over which 57 dimensional objects percolate and over which 248 degrees of freedom of the E8-group oscillate. The gravitational field strength /ehm/ is interlaced with the dark energy density vortexthrough the E8 symmetry group! From the superposed phase space is also apparent that local gravity-waves in the universe results from longitudinal density fluctuation of the energy-mass-quantum /ur/, the gravity-factor: /ehm/ = (0.4144)/1m, caused by black holes and supernovae etc. The information content of the universe, on a location domain of 1 meter, is determined from the entropy of the respective phase spatial volume. In the primordinal nucleosynthesis the first spontaneous order of the thermodynamic “neutron gas” took place in order to subsequently arrive at the stable gravitational and energetic conditions of the present universe through a break in symmetry, the “cosmic beta decay” (see 2.1.2 ; 2.1.3). The “cosmic beta decay” of the universe can be considered a fractal of the weak interaction, the beta decay of the neutron. The “cosmic beta decay” of the “great universe” is similar to, i.e. is a fractal of, the beta decay of the neutron in the laboratory. The “great universe” is a fractal of quantum space. The “utmost great universe” is portrayed on quantum space in a self-similar manner. The big bang 13.79 x109 years ago was preceded by a time period of 1.39 x 109 years by the Proto-Universe. The development of the Proto-Universe can be understood as a spontaneous quantum fluctuation. 2.1.8 The Genesis of the Universe To be or not To be? During the genesis of the Universe the fundamental components and entities, such as the energy density distribution, the order-parameter, the elementary particles and fields etc. were not ontologically primary. The fundamental components were percolated and generated through omnipotent symmetries, such as the exceptional E-8 group under CP-Infraction. The exceptional E-8 group and the CP-Infraction were ontological primary! For the Hubble parameter H0 no clear value could be determined or measured experimentally until now. The measured values, results in the area of 10 % vary depending on measure method. 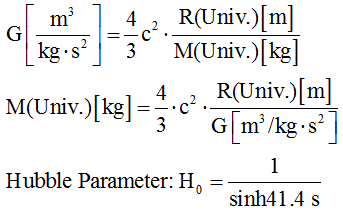 By application of the explorative analysis to the gravitational constant -G- (s.3.1) there could be determined a pure geometrical, applied value on -G- for the Hubble parameter H0 (geometrical). If H0(geometrical) is considered as a representative basic value the results of the Planck mission and the results of the gravitation lenses experiments can be verified and understood. From the above presentations it is evident that the explorative factor analysis solves the complex of the problems of the standard model of the universe and serves the understanding of those. At the optimization of tyre treads of vehicles I noted that the optimal geometry and form of the tyre treads are determined by the gravity constant -G-. In the publication of the application Patent DE 19909765 A1 of 05.03.1999 I explained and documented the physical teaching. The gravitational constant is historically considered the first physical nature constant which exhibits a direct reference to the universe through the gravitation. In the presumption that the gravitational constant has validity in the quantum metric as well as the macrocosm it was dismantled and scaled in both phase spaces into non-dimensional factors. The gravitation field of the universe results from the gradient of the dark proportion of the gravitation potential of the Planck mass c2 in relation to the whole observable radius of the universe. The expansion field of the universe result from the gradient of the gravitation potential of the Planck mass in relation to the whole observable radius of the universe. At the primordial nucleussynthesis, the first spontaneous order of the thermodynamic “neutron gas” the gravitation was identified as an accessible macro condition of the phase volume and the entropy of the universe was determined (s. 2.1.2). Through the application of the explorative factor analysis on the phase space volume the gravitation of the energy equivalent of the average linear material matter density /ehm/=(0.4146)/1m was identified (s. 2.1.5.2). The factor /ehm/=(0.4146)/1m represents the gravitational field strength of the universe. 3.2.1.2 The gravitation or rather the field strength of the universe is equal to the alteration rate of the entropy and of the enthalpy at isobaric pressure. 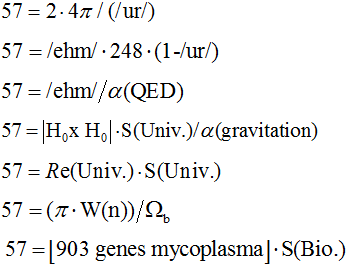 3.2.1.4 The gravitation has to be understood as the percolation of the electrodynamical coupling constant through the 57-dimensional object of the E8-group or throughthe numerical percolator /7825/ and the biological genome (903 genes) of a single-cell organism. The numerical percolator is a partial subset of the Pythagorean triple separator and assures the maximum amount of linear independent connections of the E8-Group (s. 3.2.1.8). This means that in the natural number amount from (1-7825) no Pythagorean triple separation exist. Only starting from number 7825 the triple separation is possible. 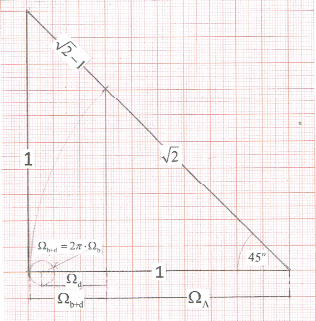 3.2.1.8 The gravitation a case for Pythagoras? From the theorem of Pythagoras and the applied topology the energy equivalent of the middle linear material density, the /ehm/, can be determined. In a “Gedankenexperiment “ (a thought experiment) a mass of 1 kg is equally distributed on a 1 meter of the universe and unilaterally lifted around 90 degree. The lifted end is thereby projectively moved around meter. If the are then topologically stretched over the horizontal 1 meter then at the opposite end the gravitation field strength /ehm/ of the universe or rather the gravitation potential will be extracted. Mystery and solution of the gravitation! The coupling constant of the gravitation is a fundamental force of nature. The coupling constant of the gravitation is emergent to the GUT-theory, that means it is derived of the superimposed reciprocation constant of the QED, the QCD as well as the “weak reciprocation” (W--Boson). The amount of the Planck length is a scale factor which specifies the size of the combination volume of a 57 dimensional cube with the enrolled 5-dimensional sphere (see 2.1.5.2). Amongst the quantum gravity the unified physical presentation of the gravity interactions in the microcosm as well as in the macrocosm can be understood here. Depending on and in relation to the quantum theory, the natural constants, the interacting quanta of the four forces of nature as well as the cosmic parameters the found relations and factor equation will be created. From the mutual comparison of the found factor equations a comprehensive Theory of Everything can be represented for the quantum gravity. 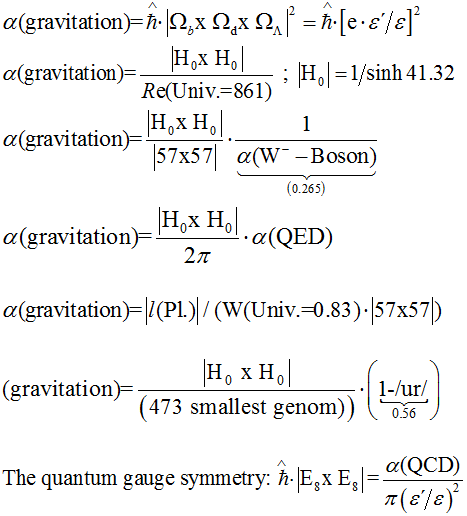 The quantum gravity results from the oscillation and the superimposition of two states of the linear mass quantum /ehm/. state : One proton equivalent (0.938) is located with the probability of (3.98/9) =0.442 on one meter location domain +- 1.5%. 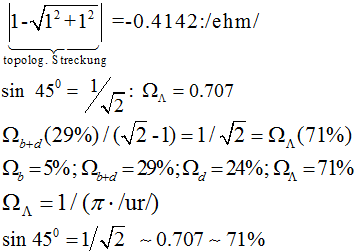 state : No proton equivalent (0.938) is located with the probability of 4.99 /9=0.554 on one meter location domain +- 1.5%. The gravity state of the universe /ehm/is causally superimposed and entangled with the Vortex of the dark energy density distribution ΩΛ. The gravitation has also to be understood as a percolation of the proton equivalent (0.938) at 248 degrees of freedom in the rotation of the 57-dimensional object of the E8-group. The standard model of the particle physics is a quantum field theory which hierarchically arranges and describes the known elementary particles, except those of the gravitation. The current standard model is not completely understood, however it was completely explained after the alleged discovery of the sought “Higgs-Boson“ at LHC. The theory for its existence and the corresponding “Higgs field” were postulated at about 50 years ago. At the time only few or rather no sufficient knowledge in the QCD, the cosmology, the static physics and the mathematics (E8-symmetric group, etc.) were available. To understand and complete the standard model on the basis of the current level of knowledge it is necessary to apply and understand the newest cognitions of the QCD, the cosmology, the static physics, the group theory as well as the “explorative factor analysis” on the measured signals. When applying the factor analysis on the measured signals, those are split in non-dimensional factors, their complexity is reduced and thus are available in a physical analysis. From the factor analysis of the registered LHC-signals their physical condition concerning energy, mass, interaction and symmetry can be determined. At the primordinal material formation (rest energy of the elementary particles) the E8-group can be understood as a gauge symmetry. In my opinion there exists no omnipotent „Higgsfeld“ from the beginning, it exists and percolates the symmetry structure of the exceptional E8–group of the primordinal nucleosynthesis of the early universe! It can be shown that the coupling constants of the “strong reciprocation” of the proton is a fractal of the cosmic energy density distribution of the universe. The power of the coupling constant is energy dependent. Two QCD coupling constants are identified. 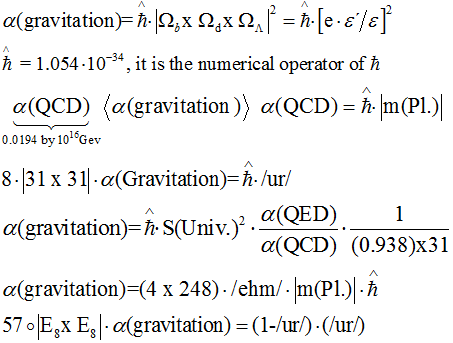 In dependence of the cosmic energy density distribution the following QCD-relations are valid. It can be seen from (2) that the dark material results from the total overlap or rather curvature of the energy density distribution of the universe! If on the measures LHC-signals the explorative factor analysis is applied, the LHC-signals can be physically new defined and understood. Exemplary the factor analysis is applied on the LHC-signals. The disassembly of the factors is made for the essential physical parameters through the geometrical number . From the above factor analysis it can be seen that the confinement or rather the QCD of the protons is energetically stimulated, percolated, filtered and radiated in two jets over the 57-dimensional object. The measured LHC-signals can therefore be understood and verified from the explorative factor analysis. In my opinion the LHC-signals were or will be measure and determined technically complete and physically correct, however on the basis of a 50 years old theory physically insufficient interpreted or understood. At doubling the collision energy the confinement will be stimulated about an integer size, the first mode, in relation to the phase space volume of W(p)= 5/6 and percolated over the 57-dimensional object. The here mentioned physical and mathematical proceedings should show a first method of application. They do not claim completeness and have to be further developed. If the biological, physiological proceedings are seen as an open, self-sustaining thermodynamic system, the change of entropy can be balanced through continuous supply of adjusted energy of the proton reciprocation or the assimilation. The accessible phase space volume of the thermodynamic system (see 2.1.3) will be increased of α(QED)=1/137.036 from W(0.833) to W(0.84) by photon reactions. For this form of self-sustainment the entropy S(bio) can be determined. The entropy S(Bio.) represents the “synthetic prim factor” of the biological physics! The genome of 903 genesis evaluated from the three order parameter of the Universe and can therefore not be patented as a technical laboratory invention. 5.1 The gravitation in the botany. The growth of plants, especially in vertical direction is limited through the gravitation. To secure the complete static the assimilation energy of the plants will be bundled in the nodium, the growth node, and this especially in and after the last nodium. From observations of grasses and conifers it was able to determine a stable growth of about 0.6 m per year. The size of this stable growth can be interpreted as entropy of the absorbed assimilation energy, under reciprocation with the gravity. 5.2 The E8-simulation in the Neurophysiology. For the HUMAN-BRAIN-PROJECT the exceptional E8-symmetry-group can be used as simulation model of the human brain. Through the thickness of the E8-group the complexity of the neurophysiological network can be reduced, structured and made available for another analytic representation and valuation. For every 1.065 1012 of the neurons a typical synaptic “action-potential-cascade” of (0.1V), asymmetrical and highly parallelized, can be determined from the 1.065 1015 synapses. The “action-potential-cascade can be simulated and/or heuristically determined under disclosure of frequency, electrical resistance, spatial expansion, space etc. 5.3 The E8-group in the genetics. The protein synthesis and the DNA-genetics can be understood over the E8-structure and represented in analytical form. The E8-group is the synthetic, cellular analogon of the ribosom of the protein synthesis. It can be shown that the disclosed in literature and partially patented laboratory synthetics of a unicellular bacterium genome (for example the synthesis of Mycoplasma Mycoides, 903 genes) can be specified and understood analytically over the entropy S(Bio. ), the E8-Symmetry of the 57 dimensional object as well the average linear material density /ur/ of the universe. 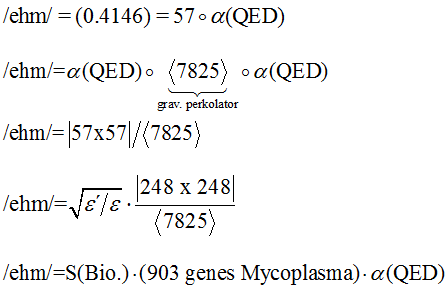 The viable and divisible genome of a minimal cell with 473 genes can analytically determined over the essentially accessible phase spatial volume W(0.84) of the biological entropy S(Bio.) with 846 essential genes under laboratory conditions. It can be seen from above presentation that the average material density of the universe /ur/ structures and synthesis the minimal genome (473 genes) of the unicellular bacterium. The synthesis and the physiological expression of the minimal genome is made over the gauge symmetry of the Exceptional E-8 symmetry group, the biological entropy, the average material density and the order parameter of the universe. The Crispr-Cas method is therefore not patentable! The synthesis of the genome (number of genes) and genome design can be analytically performed from parameters and constants of the universe, statistic physics and the group theory. The possibility of the analytical synthesis of the unicellular genome has to be considered as a scientifically, cosmological and physical discovery and can therefore not be patented as technical laboratory invention. Already registered patents and patent applications of the “synthetic genetics” ore “genome editing design” have to be newly reviewed and evaluated.